As per census East Godavari has a population of 5,154,296 in 2011 out of which 2,569,688 are male and 2,584,608 are female. Expected population of East Godavari in 2019 is between 5,721,269 and 6,700,585. Literate people are 3,288,577 out of 1,716,933 are male and 1,571,644 are female. People living in East Godavari depend on multiple skills, total workers are 2,093,681 out of which men are 1,545,831 and women are 547,850. Total 152,451 Cultivators are depended on agriculture farming out of 137,260 are cultivated by men and 15,191 are women. 878,084 people works in agricultural land as labor, men are 648,809 and 229,275 are women. The East Godavari average altitude (elevation) 0 to 10 meters above sealevel. 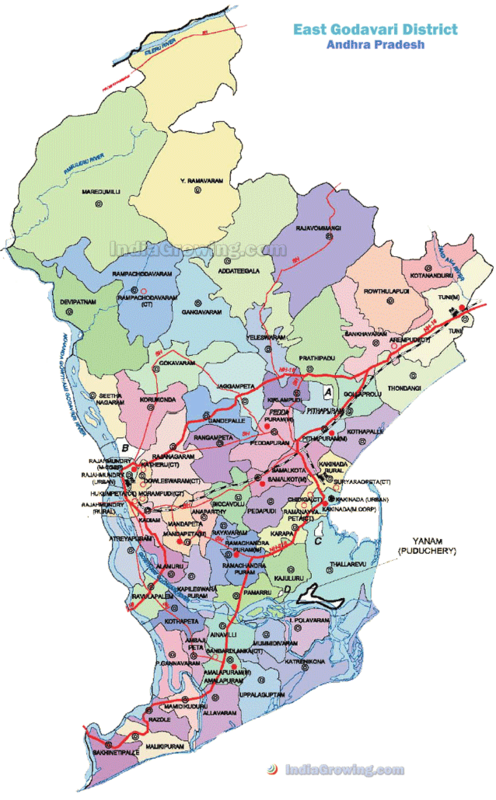 The East Godavari District is located in the North Coastal part of the Andhra Pradesh State. The Forest Area is around 29.85% of East Godavari Area. The Irrigated areas is around 61%. The Major Crops in this district are Rice, Coconuts, Bananas, Mangoes and Sugercane. Rice is constituted as 52% of total agricultural area. Development of every person is the primary..and develop family members.. Pure drinking water should be supplied by panchayat and be part of the village program. Construction of village library is needed. Realestate and layouts are spoiling the village culture, we do not want that any more in the villages, Sub Register office should take care. MG gardens ac function hall at lakkavram for marriages of all middle income people. The people lives in kotha chepuru village are lack of culture and traditions of the east godavari now,but in 19th centuries the village is full of culture and pure village nativity , later on the village loss its fame. my humble request is to take necessery actions for improvin culture and traditions an this particular village. sir village lo waste water velladanike drynagelu levu sir madhi 6th ward dhommeti varistreet varsham vasthe buradhakindha untundhi kodhhiga care thesukoni cem ent road drynage varchelaaga chudandi sir.street street ki therigi chetha partikelle sestem raavaalani korukuntunnam sir. Drinking water very problem,not cleaning,president ,mptc and numbers panchayath funds thefting.cc roads and any matters corropection persons. a small work asking money.village in old persons pechini evadaniki 5000/- amount demand,amount evakapothe pichini application tisukuni bayata padesthunaru.very bad behavior president and mptc and numbers.meru serious acction tisukovali thankyou sir ccto-CM,DISTCOLLECOR,RO,MRO. There is so meny people are sufforing for driking water. this villege is very near by godavari river but still they are facing this problem since so meny years. Maily the problem is that no one has intrested to solve that problem. in summer they are feel like a hell. Surya Prakash rao garu AMMU VARI KULADEVATA AVARU. Voter card missing required duplicate Po.Koduru, Village.Gidazam correction of father name T.M Rao isted of A.M.Rao.